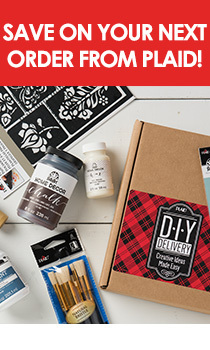 Now that school's coming to a close, we're thinking about the next craft-tastic holiday around here at Plaid - Father's Day! With just two weeks to go, we're sharing the scoop on some of our favorite daddy-friendly DIYs that are easy for little ones to help make. Give Dad a smile every morning when he drinks out of a special coffee mug created by his favorite munchkin! Let little ones finger paint onto a plain coffee cup (photo above via Munchkins and Mayhem), or let older kiddos create modern patterns with black paint against a crisp white mug. Apple Barrel Multi-Surface Paint is our fave parent approved non-toxic, go to formula - and once cured it's top-shelf dishwasher safe! Artist Kate Bullen cut up watercolors to create this modern masterpiece, but we love the same idea used with artwork made by little hands! Let your littles go to town with paints in a fun palette, cut geometric shapes, and then Mod Podge onto a canvas - Picasso would be proud! Go exploring for the perfect rocks to create the base of these DIY wire photo holders! We love the natural rock surfaces, or let the kids paint the rocks before twirling wire around the base. Top with a family photo, and voilà! Insta-gift goodness! This photo puzzle is a two-in-one - a fun gift for dad, plus he'll get to spend time assembling the photo with the family, too! Either purchase a blank puzzle, or better yet, scoop one up from the thrift store or attic, use Mod Podge to attach the pic, and let an adult cut along the puzzle pieces with a knife. Speaking of puzzles... this craft stick photo puzzle would make such a cute DIY Father's Day Card - stick a gift card for something special in the pouch for one happy daddy. We love the cool look of these Family Banners! Use the same technique to make Dad an apron for the grill or a 'play t-shirt,' perfect for an afternoon playdate! Is Dad the master of the kitchen? Let the kids choose their favorite artwork, and help them Mod Podge it onto large ceramic tiles. Follow us on Pinterest for more Father's Day Gift idea inspiration!